White Castle brings back Turkey Sliders and sweet potato fries for a limited-time this holiday season. Turkey Sliders are available in two varieties this year: the 99-cent Bistro Turkey Slider and the new Cheddar and Apple Butter Turkey Slider. The Bistro Turkey Slider features a white-meat Butterball turkey burger patty and tangy bistro sauce on a slider bun. The new Cheddar and Apple Butter Turkey Slider comes topped with a slice of pasteurized process cheddar cheese and spread of apple butter. 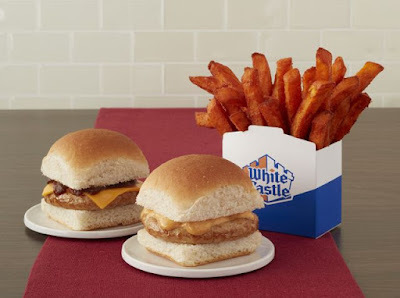 Beyond selling them a la carte, the chain is offering the Bistro Turkey Slider in the $7.99 Seasonal Sampler ($8.99 in NY and NJ), which includes two Bistro Turkey Sliders, six Original Sliders, and a shareable sack of sweet potato fries or regular French fries. As an extra this holiday season, White Castle is giving away a free Crave Caddy with every Crave Case purchase online or by mobile app, while supplies last. The caddy is an insulated bag that is meant to fit a Crave Case of 30 Sliders and keep them warm.